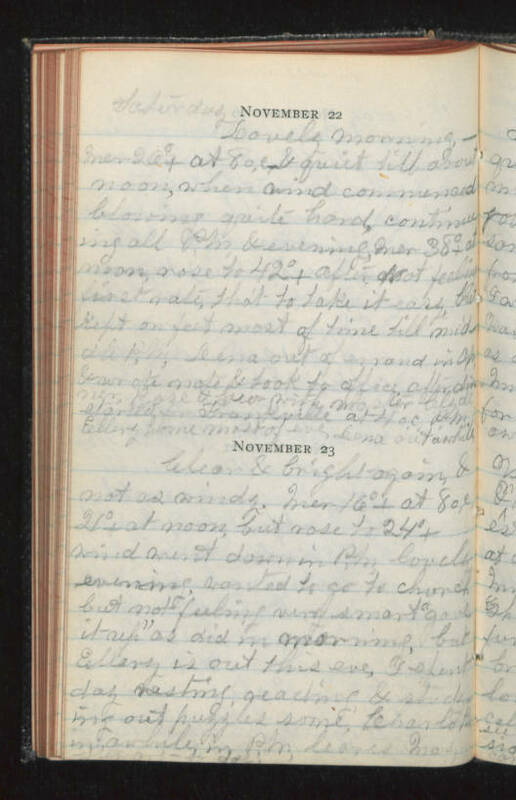 Saturday November 22 Lovely morning - Mer 26°+ at 8 o,c, & quiet till about noon, when wind commenced blowing quite hard, continuing all P.M. & evening, Mer 38°+ at noon, rose to 42°+ after not feeling first rate, tho't to take it easy, but kept on feet most of time till middle P.M. Lena out of errand in P.M. & wrote note & took to office, after dinner, Rose & Geo with Master Clyde started for Frankville at 4 o,c, P.M. Ellery home most of eve, Lena out awhile. November 23 Clear & bright again, & not as windy. Mer 16°+ at 8 o,c, 21°+ at noon, but rose to 24°+ wind went down in P.M. lovely evening, wanted to go to church but not feeling very smart "gave it up" as did in morning, but Ellery is out this eve, I spent day resting, reading & (studying?) out puzzles some, Charlotte in awhile in P.M. leaves Maz Stewart today.